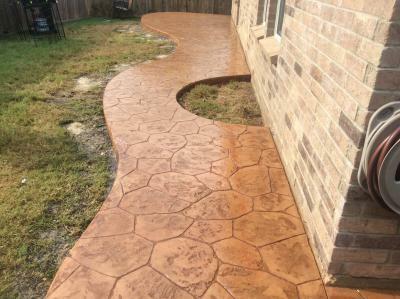 GroundScape Solutions installed a concrete patio in Fort Worth, Tx. The concrete patio was poured then stamped. Once the concrete dried GroundScape stained it with a two-toned stain. A semi-circle was left in the concrete for landscape/flowers etc. www.groundscape.com 817-759-0102 - call now for a free quote! !